How do you like them apples? Best. Movie quote. Ever. I always think of Good Will Hunting when I am wearing this dress. Strange association I know. I was a bit unsure of this apple printed fabric when I picked it up at Spotlight but when it’s on the bargain bin it’s just a little too hard to resist. I figured it would work best on a vintage pattern so I bought about 4 metres of it, stuck it away in the stash until I knew what and when I would do something with it. 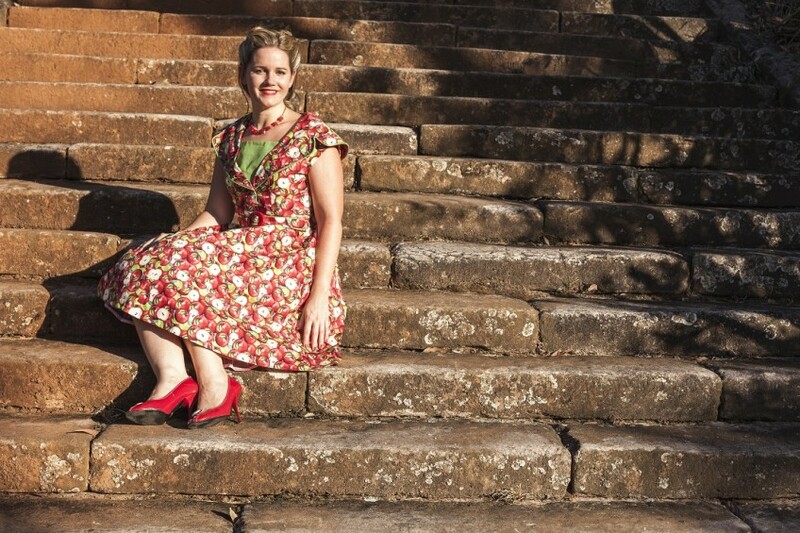 The time came when I bought tickets to the Rose Seidler House 50’s Fair. Gotta love a fair that’s primarily all about the 1950’s. Some pictures from the fair are here. 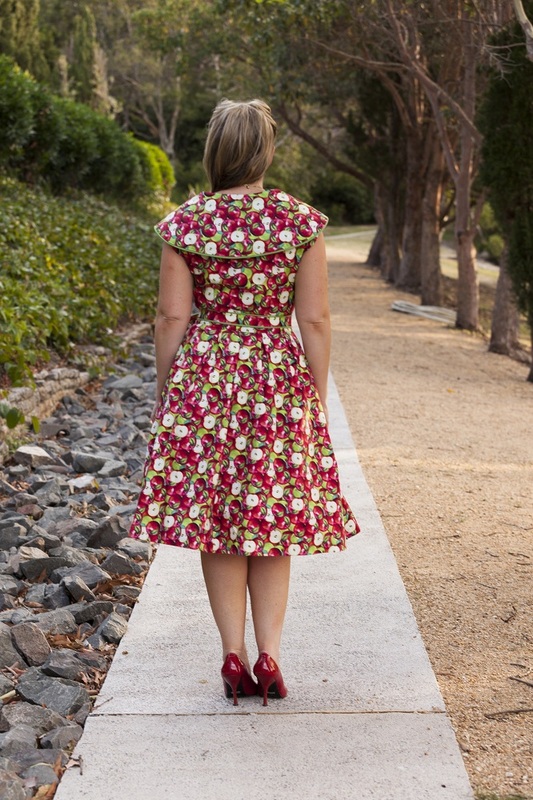 I finally had an opportunity to use one of the vintage Butterick reproduction patterns that came out last year – Butterick 5747. I snapped this up as soon as I saw it as I just loved it. I think it was the exaggerated collar that hooked me and the pleated skirt instead of a gathered or circle skirt. It was also sans zipper and had buttons instead which makes for a nice change. 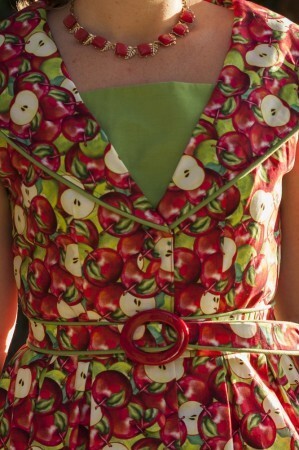 I put my apples with my pattern and I took to the task of sewing this up. I actually got started on this dress well in advance of the fair so I wouldn’t be doing it last minute. It is so much more enjoyable making something without freaking out about whether or not you’d have it ready on the day. I was so organised I even managed to scour Etsy to find a vintage necklace to match it. I am currently obsessed with buying vintage jewellery from Etsy. I never realised what I treasure trove of jewellery is on Etsy. It is a learning process though as I did buy one necklace that said it was 1950’s vintage and when it arrived it was in such mint condition that I’m almost 100% certain it wasn’t vintage at all, it was inspired by that era. 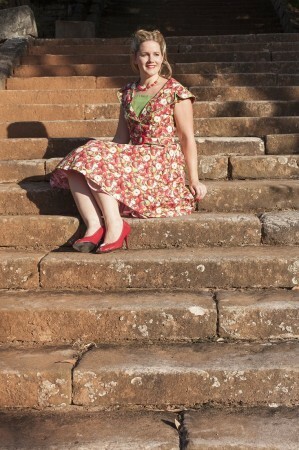 The red necklace I did get for this dress I would say is vintage and its lovely. Etsy is a great price for decent priced vintage jewellery. 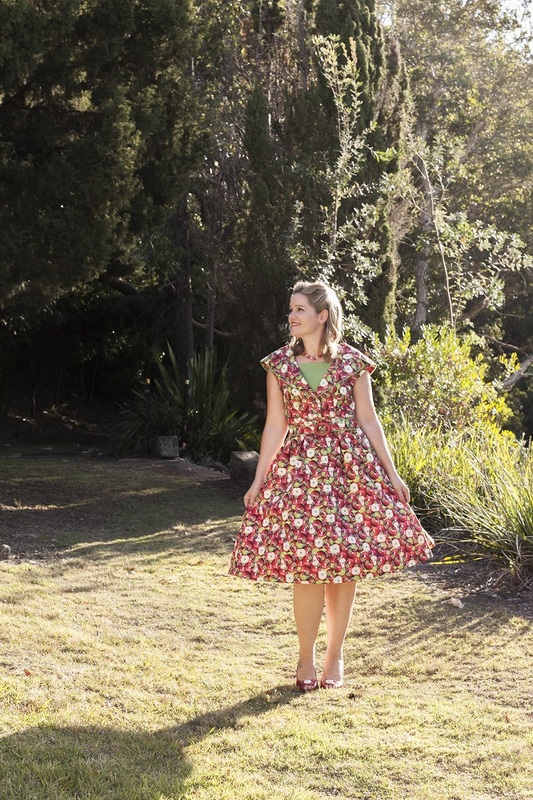 I find the vintage stores in Australia just charge too much and that’s without postage! The Butterick pattern is rated ‘average’ so I made sure I took a bit of extra time to understand the instructions and pull it together. The skirt panels are pretty straight forward and thankfully this pattern doesn’t have lining or separate sleeves so the top wasn’t too challenging to pull together in the end either. The biggest challenge I had was the piping. To make the collar stand out more and to add a little interest I decided to make my own coordinating piping. Don’t be turned off about making your own piping, it’s actually pretty easy and oddly enough kind of therapeutic. You cut bias strips (about 6cm in width) of the fabric you want to use, I opted for green quilting cotton and sewed them together so you have a continuous line of fabric in the length you need. Check out these great instructions on how to do this. If you can quilt, it’s the same process for making binding too. I bought thin white piping cord, most haberdasheries like Spotlight or Lincraft have this. Buy it the thickness you want the piping to look like in the end and factor in that fabric will cover it so that will make it thicker again. Fold the fabric cover the piping cord and then using your zipper foot sew a line of stitching right up close to the piping. Be careful not to stretch the fabric when making it as it’ll make the piping all loopy. 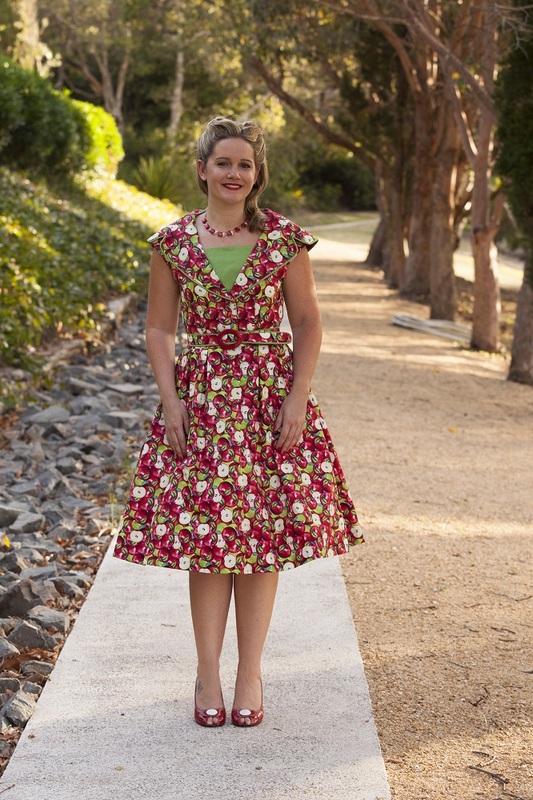 When I made mine I had probably bought piping cord that was a little too thick but I don’t think it looks out of place on the dress, it just meant it was a bugger to deal with on sharp curves like where the collar indents on the sides. Piping won’t work everywhere on an outfit, its best on seams that are relatively straight or not too curved/sharp otherwise it’s an epic process to get it looking right on busy seams. 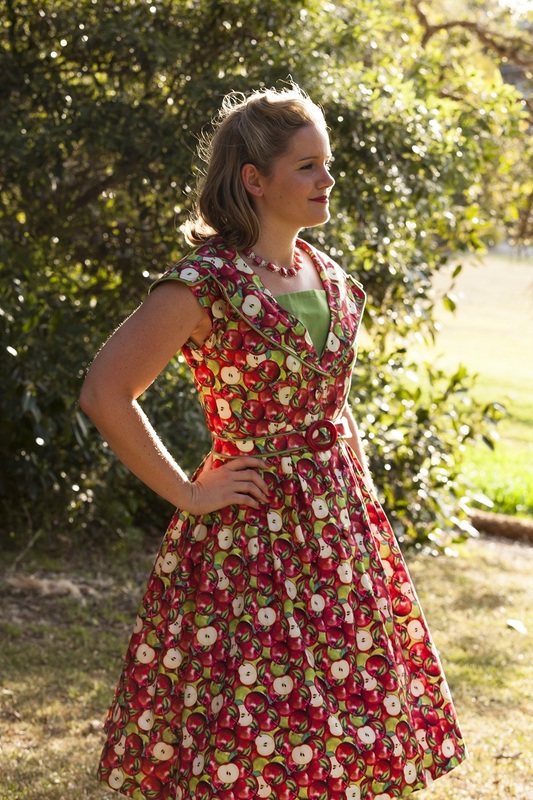 I machine sewed the piping on before I lined the collar with the same fabric as the dress. I was a bit worried the collar would stick out at the sides and be too big but once you sew it up it looks fine, not too NFL player. This was my first dickey - which by the way is the weirdest name for this thing ever! They suggest you button on the dickey to underneath of the bodice but I opted to use snap on fasteners as I figured they would be easier with getting it on or off. There was no two ways about not putting the dickey on with the dress as it shows way too much clevage without it. I actually quite like having that contrasting dickey attached to the bodice to highlight the collar more. I had the buttons covered in the same fabric. I went and got this done by a button shop given how cheap it was I couldn’t justify buying the materials and the time it would take to do it myself. One of these days I will learn how to do it myself! I also decided to make up a belt for it, and used the same technique and materials I had done previously. Sunni from the A Fashionable Stitch blog has great tutorials on how to make fabric covered belts and she sells some of the materials needed to make them. Including the funky red buckle I used for this belt. This print is super cute! Makes me want to whip up my own apple print on Spoonflower. :D I love the dress! Great job...wonderful colors...keep up the fun work. I am seriously obsessed with this dress! Next time I pattern shop, this one is coming home with me! The apples are too cute, and I love the way you trimmed with bright green. Awesome! Love your dress and the styling. It really does look beautifully made. This is such a summer treat! The matching belt is too cute and the doickie (dang that sounds odd!) makes for a great contrast and highlights the collar. Radness! Thanks mate - yes making and wearing a dickie is certainly something new!! Your version looks smashing!! I do love this pattern...although I pretty much say that about any shirt dress. :D Are you a member of the Sydney Spoolettes on facebook?